If you’ve made it this far, congratulations, you’ve earned the right to read the results! If not, you could be doing yourself a big disservice and not understanding the true intricacies that underlie the subject of battery testing and the methodology which was used in testing, in which case, I strongly recommend you read the first two parts before proceeding. The following results and data are the product of a large number of hours of investigation conducted by myself on the cells I have purchased using the gear as detailed in previous parts. The information is not guaranteed to be fault-free, and is provided in good faith as being representative of the performance of cells I have acquired. I have taken measures to ensure the accuracy of the data. The data represents the cell performance under the test load only. Variations in delivered charge under different load conditions are expected and can result in different value to the end user. The tests do not assess any of the other qualities related to the cell, including the cell design for its resistance to leakage. There is inherent cell-to-cell variation, which may not be adequately captured by the sample size used in this investigation. Value for money judgments, especially those made in the results, are based on the price at which the cells were purchased or made available to me in the period of November – December 2016. As prices for cells are inherently volatile, the value for money figures are likely to change wildly depending on supplier specials and location of purchase. I cannot and will not be held liable for any errors, omissions in the data or consequential losses of any kind from the use of, or inability to correctly use, the provided data. You use the data at your own risk, and no implications about its merchantability or fitness for (your intended) purpose are made. In the interest of full disclosure – I am merely a hobbyist with an interest in batteries, and some test equipment. I do not have a certified test lab, nor do I have any financial relationship with battery manufacturers or their suppliers. I do have a PhD in Engineering, and I believe I know what I’m doing, however, please interpret the information accordingly as with any other information you find on the internet. Data was gathered using the Sequence Test program, and processed using Excel. The mAh and mWh figures were determined by piecewise integration from recorded meter data (and not time data). Based on the datasheet figures and test parameters, the expected margin of error is approximately 10mWh and 9mAh. However, based on the calibration report, the unit far exceeded its specifications, and it is thus likely that the results are much more accurate than the margin of error would suggest – e.g. at 0.1A, the allowed error is ~1.5mA, but this unit had just 0.1mA of error, and at 1.5A, the allowed error is ~2.2mA, but the unit had 0.1mA of error. Weight data was gathered with a cheap set of Chinese pocket scales with a resolution of 0.01g. Based on my own informal experience with the unit, repeatability is within 0.03g. The summary table has the means denoted by the ‘m’ suffix, and standard deviations denoted by ‘s’ suffix. Cells which are more “green” are better, with cells that are more “red” representing less desirable traits. The yellow shaded rows represent the reference cells, whereas pink-red rows indicate expired cells. The table is ranked from lowest to highest cell capacity by mean mWh. Prices are based on the prices I paid, with pack sizes varying significantly, with cost-per-cell and value-for-money calculations based upon these prices. However, as prices for cells are very volatile, these figures are not expected to be highly useful, but merely serve as an indication. Batch numbers are included where visible – some of these numbers are manufacturing dates on the package or scribed on the cell, which can be useful in determining cell freshness. For example, Energizer-family cells use MMYYX as the code, where the X is an optional character position. Duracell-family cells sometimes have their month and year of production printed on the cardboard box. IKEA and Varta cells have the production date information prefaced by “PD”, with IKEA giving the full date, and Varta giving MMYY. Expiry dates are noted from the most specific source (usually the cell) in the format as used by that manufacturer. Country of origin was noted. The table is filled with information, but as usual, there’s more. In the next few sections, I will try to detail various conclusions that can be drawn from the collected data. Cell capacity is probably the most important and interesting parameter to some users, so lets look at that first. All charts can be expanded – use your scroll-wheel-click to open in a new tab. The graph above shows the cell mean mWh across all the test samples at the red dot (it is sorted in order by the means), as well as the maximum and minimum across all test samples by the black bar (as standard deviation of two-to-four samples is not particularly solid). The mean capacity of the mean values is 1473.3mWh. Lines have been added to indicate the mean capacity and the range of capacities 10% above and 10% below this mean. On the whole, it seems that a good number of the manufacturers managed to fit their mean results within this 10% margin, meaning that there’s about a 45% chance that any random battery you buy is not any more than 10% better-or-worse than the average. Of the cells, the reference Ni-MH rechargeable cells exceeded the performance of all alkaline cells under a constant power 0.48W load. This result seems to fly in the face of some naysayers who still stay with alkaline cells on the belief they have better energy density under high loads. The reverse is likely to be true at low loads where alkaline cells reportedly achieve up to 3900mWh, but that was not tested, and low loads are unlikely to chew through enough cells to make these kinds of decisions financially meaningful. The worst cell is, as expected, the Wincell Super Heavy Duty carbon-zinc based reference cell, which achieved about a fifth of the mean alkaline capacity. The best alkaline cell was the Duracell Ultra with Powercheck, achieving a result which is “head and shoulders” above the rest. The variation in the power value within the sample was somewhat wide though, suggesting there might be some quality control or purity/freshness issues. The next best was Energizer Max + Powerseal, with a smaller variance, overlapping with Winmax Super Alkaline, Winmax Extra Alkaline, Industiral by Duracell, Energizer Max (Old) and Energizer Advanced. Interestingly, the Winmax brand is commonly thought of as “cheap and cheerful” and is often available at variety stores at fairly good prices, and managed to achieve a result that matches the “big names”. The Energizer branding itself seems to have fallen apart – the Max + Powerseal is their “lowest” end product at retail, and it along with a two-year old batch managed to beat the more expensive Energizer Advanced. Worst still, the Eco Advanced cells with a claimed 12 year shelf life which were two years older than the Advanced scored much worse with a result that straddles and falls below the average line. It seems that there is a lot of shelf-life up-rating going on, possibly with little-to-no consideration of exactly how much power is delivered at end of life, or the probability of cell failure. Following that, the cells start to approach the 10% above average mark, with Coles Advance+, IKEA Alkalisk (2006), Energizer Industrial, Varta Industrial, Eunicell and Activ Energy all sitting on or close to the 10% above mean capacity line. As far as the poor cells go, Kodak Max managed to get last place with all the alkaline cells. It seems to be a combination of poor cell manufacture, and the batteries approaching their expiry date (11/2018), with a moderately consistent result. Eveready Gold was a big disappointment – while posed as a reliable value choice, it was found that their cells generally underperformed, and one cell within the sample was quite close to being dead right out of the box. The Naccon cells expired a year ago, and had exactly that – one dead cell in the batch that could not sustain the load even for a second. The expired Fuji EnviroMax Digital Alkaline from Woolworths was the next worse, although moderately consistent. The original Duracell Coppertop series, that still has two years until expiry, managed to be a set of cells that leaked before testing started on them and fared poorly, which is not unexpected. This is followed by the “newer” Fuji EnviroMax Super Alkaline, Duracell Coppertop (expired 2015), and Fujitsu Alkaline G which all had means and ranges (mostly) below the 10% under-mean mark. The poor cells that straddled the 10% under-mean line included the Pairdeer Super Alkaline, Kodak Xtralife, Vendom Alkaline and Daiso & HZ Alkaline Battery No. 8. It seems that the commonality amongst some of the poor results relate to batteries produced by FDK Corporation under the Fuji and Fujitsu branding, as well as batteries branded Kodak. Expired and leaking batteries also had a propensity to score lower – although this is a fairly obvious outcome. The remainder of the cells were generally “quite average”, however, a mention should be made about variance. Within the “quite average” range of cells, the old Fuji EnviroMax Super Alkaline, Proelec Ultra, Varta Longlife and Varta Industrial all showed higher than expected variances in this test. This suggests potentially poor quality control, in the sense that if you buy a set of batteries, some of the cells can differ in capacity by over 10%. This is significant, especially when cells are used in a pack in series, as differing capacities will have the pack capacity limited to that of its weakest member. Interestingly, the older Fuji EnviroMax with the closer expiry date performed much better than all the other cells, so the reason appears to be manufacturing/sourcing related rather than freshness. Interestingly, looking at the regional variations in Duracell Ultralock gives us no reason to believe that certain markets get better or worse cells. While there was a small spread, this can be accounted for due to the freshness of the cells, and all of the ranges (pretty much) overlap at the edges suggesting the difference is not significant. The most average batteries in the set are the Performer Ultra and Eclipse Super Alkaline. Other surprises were that the Panasonic Evolta was only slightly above average, the majority of “regular” series Duracell Coppertop Duralock batches were around the average mark, and some lesser names managed to make it fairly high up the “ladder”, such as Eunicell, IKEA, GP and Winmax. Maintaining the same order, but plotting based on mAh delivered introduces some slight jitters in the graph. There are no major upsets, but subtle “rearrangements” in rank. This is expected, since I mentioned in the first part, that the average voltage for all cells is not going to be the same. This is why I put my money into the mWh graph, as that is where the energy is, and those ranking based on mAh may be misled or arrive at different conclusions. Of course, all of this means nothing unless I can save some money, right? Well, I had a feeling you might have that kind of thought, so I decided to plot the amount of mWh you get per dollar based on the prices I had in the table. This is very crude, as prices fluctuate quite a lot (especially at retail) and thus re-organization is expected, but the chart is not without its own charms. On mean capacity, the Varta Longlife is going to give you a significantly more amount of energy per dollar than the rest. Following this is a “shelf” of IKEA Alkalisk (2016), Fuji EnviroMAX Super Alkaline (Old), IKEA Alkalisk (2014), and Eunicell. Another step down, and Performer Ultra is on its own. Then another step down and we get into a “curvey” situation with another bunch of cells. The gist of it is that the Varta Longlife posted a good score, but it was by far the cheapest per cell because of its selling price at Bunnings Warehouse. This makes it a commendable buy. The IKEA cells which I have long used, are also a good buy. What isn’t shown is that while the Proelec Ultra takes 8th place further down, I have purchased them on sale at prices of $0.20 per cell rather than the $0.526 per cell used to calculate this table, thus when on special, the Proelec Ultra would jump to first place by a significant margin on that alone, which is why this graph is of limited value. That being said, there is one red diamond on the graph where the carbon-zinc battery is. This is cheap, ugly, old technology. Cells to the right of the red diamond were bought at a price too high, and give you less energy per dollar compared to even the old crappy batteries. This shows just how much retail mark-up has done to the price of batteries, and partly why I had to spend so much to obtain them all. It is an expensive way to get energy – at a peak of about 4.7Wh per dollar, compared to about 3570Wh per dollar to buy energy from the grid, recharging batteries doesn’t sound so costly after all. As many people publish the voltage profiles, I thought I’d do the same even though it’s not likely to be that meaningful. As a result, I grabbed the first result from each type of cell and plotted it to create this very messy plot. Already, we can tell that the Ni-MH cells outdo the alkaline cells quite handily. But even more interesting is that those who claim the lower nominal voltage of Ni-MH causes problems at high load really need to take a second look at the graph, as the alkaline cells do a very poor job of maintaining their voltage, with many of them falling through the Ni-MH voltage level about a quarter or a third way through their discharge. While Ni-MH cells are unlikely to give proper capacity indications due to their “mostly flat” voltage gradient and steep fall-off towards the end, they are also superior at heavy loads due to their lower internal resistance. As expected, the carbon zinc battery was the worst, in the dark blue, having very little hope of sustaining the load or its own voltage for that matter. Lets remove the reference curves and re-plot. Slightly less messy, but almost utterly incomprehensible. The cells all seem to bunch together into a band – some steeper fall-off than others, some not sustaining voltage as well. The stepped appearance and slight kinks have to do with the electronic load’s internal feedback adjusting the current to maintain constant power operation, but at least this sort of illustrates the fact that below a certain level, cut-off voltage is unlikely to make a big difference in measured cell capacity due to the steepness of the voltage curve at that point (at least, in this constant power case). To make it more comprehensible, I’ve broken down the curves into different sub-graphs based on family or the way they were obtained, which can be viewed clicking the thumbnails below. I don’t feel they add much value to the analysis, so I won’t comment on the curves individually. As I commented that the nominal voltage is not the voltage the cells are likely to operate at, I decided to plot the average discharge voltage (i.e. mWh divided by mAh). It’s clear that for the Ni-MH cells, they did achieve their nominal voltage almost exactly (1.200V and 1.205V for cells which should be 1.2V). The majority of the alkalines hovered between 1.07 to 1.13V, with some very poor cells achieving less. Only one was obviously above the rest of the pack, which was the Panasonic Evolta. 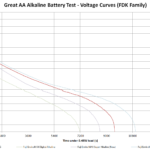 As a result, the claim that some batteries are better for digital appliances may have some merit in this one case where a higher average voltage might mean a better extraction of available charge, but it’s notable that all the other “digital” alkalines seemed to do no better or worse than the regular alkalines which suggests that it may indeed be “marketing hype”. The fact that the Ni-MH cells achieved the highest average operating voltage also suggests that Ni-MH cells are again more suitable, even for devices with slightly higher voltage cut-offs. The whole “rechargeables cause problems” is probably a story left over from the old Ni-Cad days where 600mAh cells were the norm. It’s good news, since rechargeable cells can help the environment by reducing landfill. This is an idea I’ve heard floated for various sorts of batteries, so I wanted to see if it was true. I plotted all the mWh capacities of individual cells against their weights, and tried to fit a line to it. Two problems seem to occur – the first being that there is no great relationship across the population of cells, and the second being that the variation in cell weights are lumped around a fairly small weight range where the accuracy of the scales is approximately 0.3g (or one and a half units across). I suppose it’s a good thing if we’re talking about quality control to have a small weight spread, but this also means that the cells outlying have more contribution to shaping the fit. Ultimately, using weight as a blind indicator of cell quality seems unwise, unless the weight is “outlying”. However, the story does not end there. If we plot each type of cell as a separate series, we can see that within the same type of battery, for most batteries, there is some sort of correlation between higher weight and higher delivered capacity. Some variations are expected, e.g. due to cell impurities in ageing. 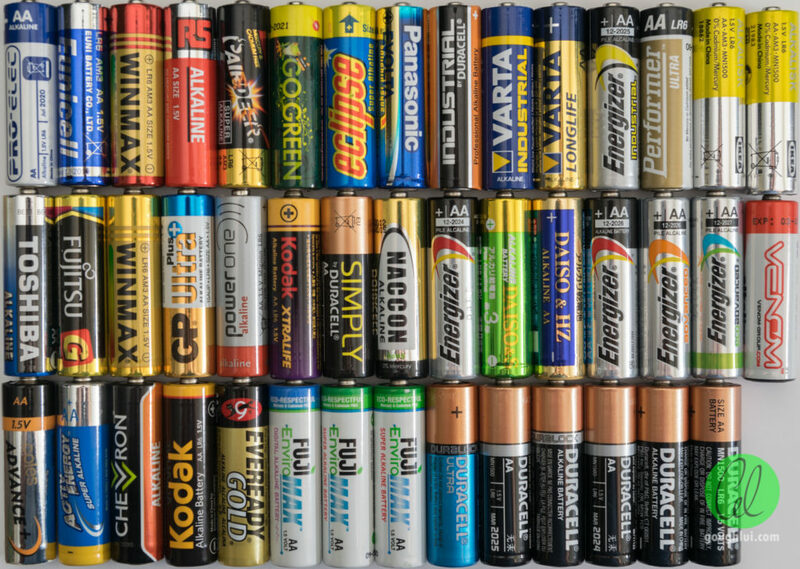 Using the same rank order and plotting mean weights and ranges reconfirms this – for the most part, there is no drastic weight differences within the batch, with the exception of the best performing Duracell Ultra with Powercheck. Part of the reason is the higher density material within, and the added weight of the battery-side power check meter. Which got me thinking – how can someone without such specialized equipment try to gauge the quality of the cell? The open circuit voltage is understood to be related to the purity of the cell materials, and is also related to state of charge in a loose way, so is it possible that open circuit voltage can be used to predict cell capacity or freshness? From the means and ranges, it appears that the answer is a qualified no. Unless the cells are leaking or really old, it seems that the open circuit voltages only reside in a fairly small 1.58-1.62V window for the better cells. But there is some suggestion based on the results that it might be able to predict cell freshness. To do this, I selected the subset where production date was known, and plotted the open circuit voltage with today’s date on the rightmost. It seems to be quite a loose relationship – the older cells show a wider voltage variance as they may not have aged equally, and there are some variances because the results are across different brands of cells which may have different purity or slightly different geometry/formulations but there seems to be some evidence that open circuit voltage could predict cell freshness, but not that accurately. Ultimately, when batteries are sitting on the shelf, the only real indicator they seem to have is the expiry date. This makes me wonder whether you could buy better batteries just by buying the ones with expiry dates further into the future. Plotting available capacity versus expiry dates across all brands, it seems there is a slight relationship, although it is not very strong. The reasons for this are likely to be differences across different brands of cells having different intrinsic design capacity, as well as the “up-rating” of the shelf life of cells which ranges from three to twelve years in the sample. How much energy you get, or the probability of cell failure, at the end of this period is not well defined to my knowledge. As a result, buying on expiry date alone is not a great indication of the “better” battery, although within the same type of battery, the one with the further expiry date is the fresher battery as the expiry date is normally just the production date + shelf life. In some types of cell, the production date can be found in the printing, which makes for easy choices. A lot of findings were made in this investigation – a rank of the cells based on their delivered capacity, a look at value for money, their voltage profiles and a number of hypothesis surrounding weight, open circuit voltage and expiry date. In summary, it seems that the Ni-MH cells outperformed all tested alkaline cells at the 0.48W constant power load. The voltage maintenance of the cells was superior, and the cost of ownership is fairly small compared to the increasing expense of disposable batteries. If anything, the alkaline battery test actually showed that Ni-MH cells are the superior choice for heavy loads. 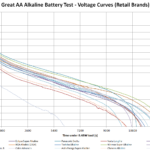 Not withstanding this, the Duracell Ultra with Powercheck takes the crown as the highest capacity battery tested, with the Varta Longlife taking the crown for best value for money at the prices I have listed in the table. Kodak Max takes the wooden spoon for being the worst alkaline battery tested, with Eveready Gold being second last. Unfortunately, due to retail-mark-up, a significant portion of the tested cells were worse value for money than even a cheap primitive carbon-zinc battery. Mean discharge voltages for all alkaline cells were similar with the exception of the Panasonic Evolta which had a higher average voltage. Weight was found to be a predictor of cell capacity only within the same make of cell. Open circuit voltage was found to loosely correlate with cell age. Expiry dates were not firmly related to available capacity overall due to different shelf life ratings by manufacturers ranging from three to twelve years and different technologies used in the cells, although could be a worthwhile factor if comparing multiple packets of the same type of cell. You might think that the fun and games are over, but there is still one more part. I literally peel my skin apart in an attempt to determine whether the relationships between different cells and their manufacturing equipment, or manufacturer through looking at the cell’s physical characteristics.